Fund Overview gives in-depth information about the funds, to help our customers know better and take informed decisions about investments. The following are the things included in the fund overview. My Funds - In My funds you can see all the funds which you have added. You can update or delete your funds from this section. Search option is also available in My Fund section. Fund Strategy - Mainly focusing on the strategy, stating the objective of the fund, the categories it invests in, the proportion of assets distributed etc. Quick Facts - Information like ISIN, Category, Inception date, NAV Value etc is displayed giving an overview about the fund. Cumulative performance - Performance displayed in a graphical format, helping investors to get a better view of the funds to help them make better know how. Statistical Analysis - Through Statistical Analysis investors get true interpretation's about the performance of the fund. Monthly Fund AuM - The chart shows the exact percentage of increase or decrease of Asset Under Management, the funds had in the past. Monthly Firm AuM - The chart shows the exact percentage of increase or decrease of the Asset Under Management, the firm had in the past. 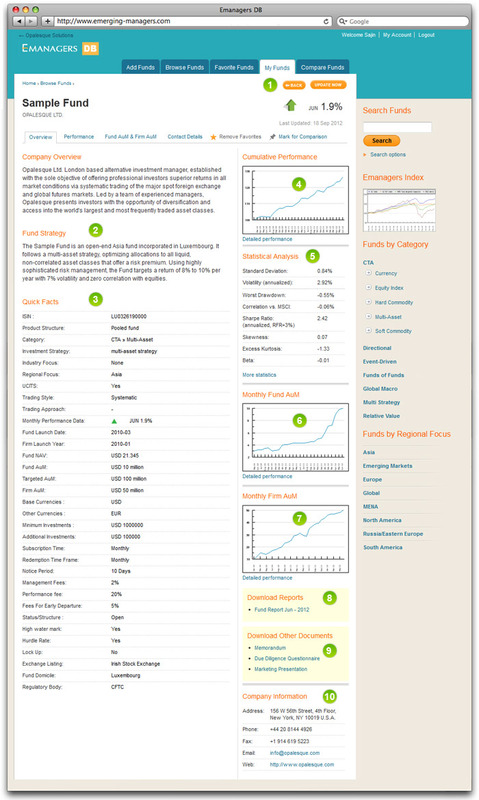 Download Reports - Investors would get full information about the fund through firm's monthly performance reports. Download Other Document - Download Section gives option to the investors to view fund's memorandum, due diligence & marketing presentation. Company Information - Contact information like address, phone number, fax number, email Id and website is listed here. 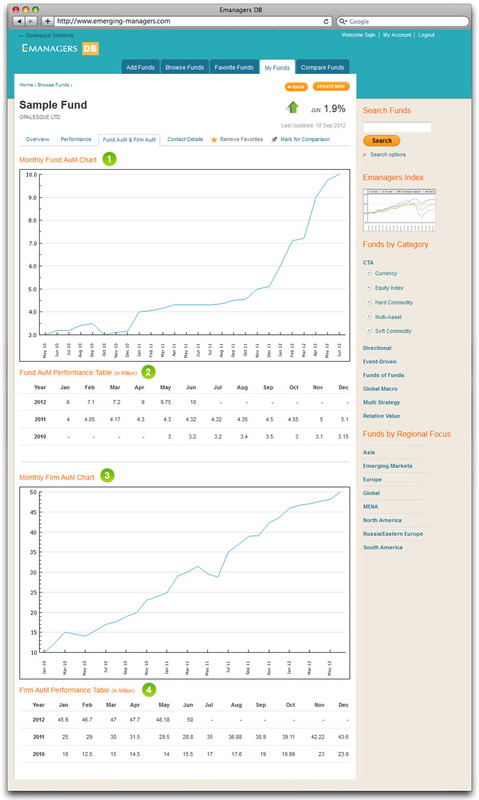 The cumulative performance chart and the table present in our database would help our customers know about the fund's performance in the past and the trend. It also helps him compare different funds performances. Cumulative performance chart - Graphical presentation, giving Investors an overview of performance, over a period of time. Performance Table - The performance table shows the exact percentage of increase or decrease of the performance, the funds had in the past. Add to favorites - Asian Hedge Funds Database with 500+ alternative funds allows its users to mark their favorite funds. The user can mark his favorite funds from the 23+ different categories and make his own list of favorite funds to refer back with convenience in future. Mark for comparison - The database with vast range of funds, makes it possible for the users to compare different funds on the same page and get better understanding. A detailed information about Fund AuM & Firm AuM of the funds is given here. Monthly Fund AuM Chart - The chart shows the exact percentage of increase or decrease of Asset Under Management, the funds had in the past. 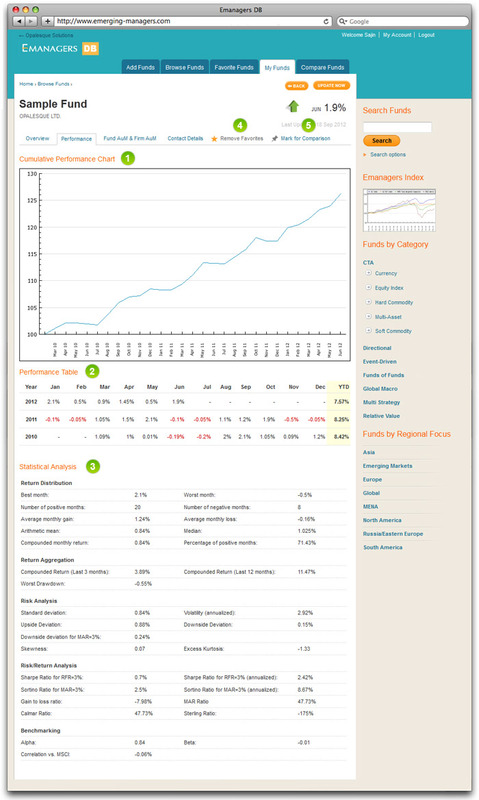 Fund AuM Performance Table - The performance table shows Asset Under Management of the fund month wise. Monthly Firm AuM Chart - The chart shows the exact percentage of increase or decrease of the Asset Under Management, the firm had in the past. Firm AuM Performance Table - The performance table shows Asset Under Management of the firm month wise. A detailed information about all the contacts of people involved in the functioning of the fund is given here. Manager(s) information - Manager's contact information like the manager's name, Phone number, Email address etc is listed here. Administrator's information - Administrator's contact information like the name, Phone number, Email address etc is listed here. Auditor's information - Auditor's contact information like the name, Phone number, Email address etc is listed here. 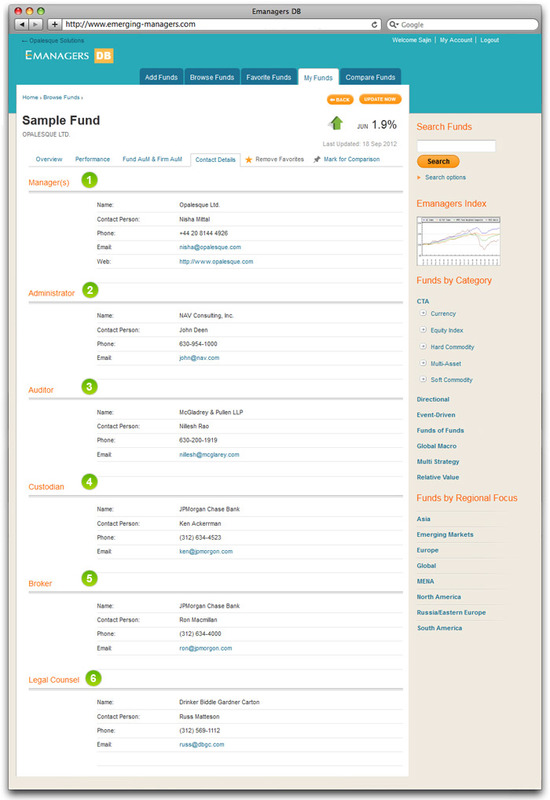 Custodian's information - Custodian's contact information like the name, Phone number, Email address etc is listed here. Broker's information - Broker's contact information like the name, Phone number, Email address etc is listed here. Legal Counsel's information - Legal Counsel's contact information like the manager's name, Phone number, Email address etc is listed here.